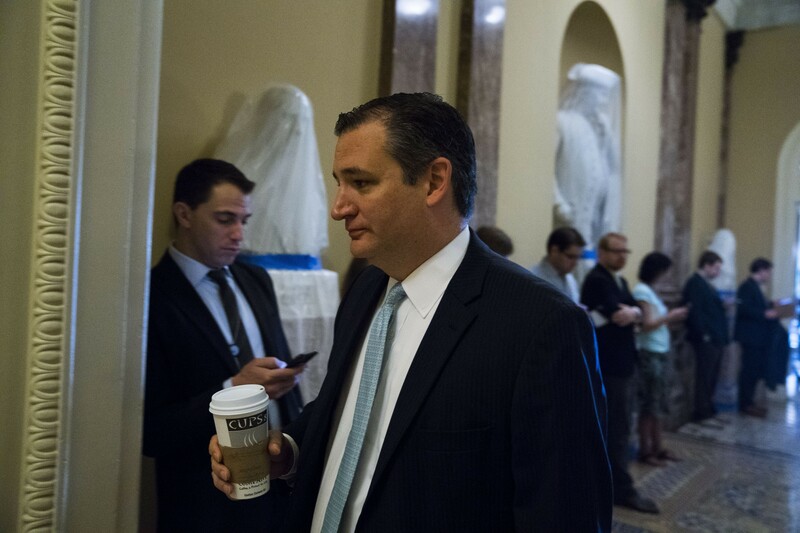 Sen. Ted Cruz (R-Texas) on his way to a meeting on Capitol Hill, in Washington, June 22, 2017. The White House is backing a health care proposal advanced by Cruz that would make it easier for insurance companies to avoid complying with consumer-protection standards, siding with some of the most conservative senators. With Congress set to return Monday after a week’s recess, Republican lawmakers are increasingly aware that their seven-year promise to dismantle President Barack Obama’s largest policy achievement is deeply imperiled. Sen. John Hoeven, R-N.D., signaled this week that he would not vote for the bill as written, following negative remarks from other senators with large poor and rural populations. That was the 10th defection. Three other Republican senators, Bob Corker of Tennessee, Charles E. Grassley of Iowa and John Boozman of Arkansas, have withheld their support, although they have not declared their opposition, and others have largely remained silent. Grassley told voters Friday that he was unsure if he would vote for the Senate Republican bill in its current form, according to The Des Moines Register. In small counties, rural hospitals and other health care providers are often the largest employers, and after years of railing against Obama’s law, Republican senators are grappling with the impact of its possible demise. Well short of the 50 votes needed to pass his bill, Sen. Mitch McConnell of Kentucky, the majority leader, repeated his fears this week that his party may be stuck tweaking the Affordable Care Act with Democrats. If Republicans cannot pass a bill on their own, they may need to work with Democrats on short-term measures to stabilize insurance markets. Republican leaders may have worried most about Republican senators from states that expanded Medicaid and feared the loss of federal funds, but objections have also come from other places. Twenty Republican senators are from states that have expanded Medicaid; 32 are from states that have not.